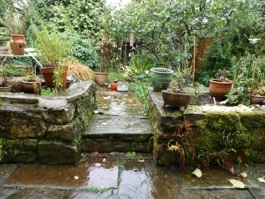 I am away from home this week at my Dad’s and it has been quite rainy here in South Street. Dad and I have been feasting on charcuterie from Trealy Farm which I brought with me and goat cheeses from Somerset. We have had smoked salmon carbonara macaroni based on a Carl Legge recipe and beetroot soup and far too much cake. We have been spoiling ourselves. I made an attempt at some sourdough loaves. I brought my starter with me, and bannetons and a razor blade. But I only had a small oven tray and the two loaves got cosy while they were baking. Oops! Rainy and damp but still beautiful. Life goes on. 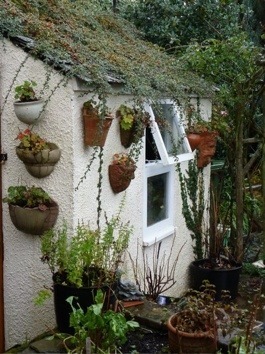 This entry was posted in Garden on 31/10/2012 by Joanna. Sunny today and we walked along the railway turned into walkway up to the cemetery, and then stopped for pastrami on rye and a coffee on our way back. Now off to see Bond in Workington :) Hope all’s well with you ! Love the cozy bread loaves! Sometimes when I make bread bears they hold hands and bump bottoms– so cute! Spoiling yourself with a fellow foodie means some very fine food and meals. Enjoy! I just went and looked at your Berwick holiday bread, impressively holey. I only took small bannetons with me honestly ;) It’s terrible when you prefer your own bread to anyone else’s. Most commercial bakers use less salt these days than I do and still they underbake (or so I justify my travelling with starter acitvities). 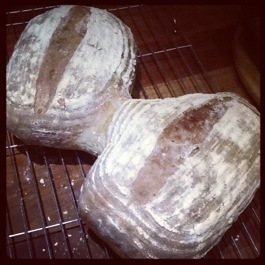 You’ve got twin loaves:) They look fantastic, despite being “conjoined”. Your Dad must love your company, I know mine would.. especially with all that cooking! I LOVED your poem at the end.. it was a nice treat! Shh… I rather like his company too – thanks for reading Smidge, I am very behind at reading blogs at the moment, will catch up when I am home again. Hope your Dad is ok Joanna – there’s such wonderful comfort in shared enjoyment of food and delicious treats. 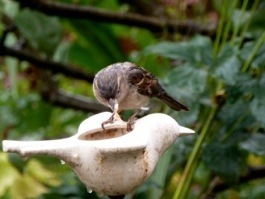 That’s a really lovely photo of the sparrow and the little poem makes such a lovely comment. I always ‘fall’ into pictures which look out onto soft, rain washed landscapes and the sense of drawing in and security that it gives. He’s doing well and we collude about eating all sorts of things to please ourselves. Last night we went out for a Balti, splish splash through the rain and came home and ate Cadbury chocolate mini rolls which were unclaimed by trick and treaters. Today is colder and brighter and the light is golden on autumn leaves and everything a bit slippy under foot. How utterly delightful. What a lovely memory to have. I love your Siamese loaves! Actually, I often try to do that, because I sort of like the look of the ‘scab’ where they come apart – very nice. The rain was strong yesterday morning, ran rivers through the car park, but nothing like the rain you have had in the US, or indeed the rain they had when they were flooded here in 2010. 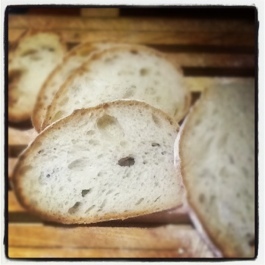 Those loaves were a bit naughty doing that but I quite like the batched sides too ! Love the little poem – you’ve obviously got your father’s poetry gene. aww thanks, I do the odd bit of writing, but I don’t usually put them on this blog. I was trying to do a little post just to stay in touch and the poem came first so I thought what the.. and here it is. Love to Spot! I hope you are enjoying your time together and the weather is being kind enough. I love your loaves – the conjoined bit is the best bit (well, aside from when you want the crunch, but perhaps you know what I mean). Lovely pictures, I wish I had been able to capture the Jay I saw fleetingly this morning, but he was gone as soon as I noticed him. We had a great time thanks. The weather was fairly dire but I think it has been the same for everyone this last week in England. I hadn’t realised so many people like joined up loaves, maybe I should do more of them, less crust and more soft bits :) Jays are wonderfully glamorous birds aren’t they? with that soft pinky brown colour and the flash of blue under their wings.